I’m writing this letter to address a rumor that has been going around about our Liberator comic book Kickstarter campaign. The rumor is that in some way I’m “cashing in” on animal rights. First off: It’s not true – the rumor is only that: a rumor. Even if this person missed the countless interviews I have given across animal rights websites, they should have at least read the Kickstarter page before spreading this offensive lie. 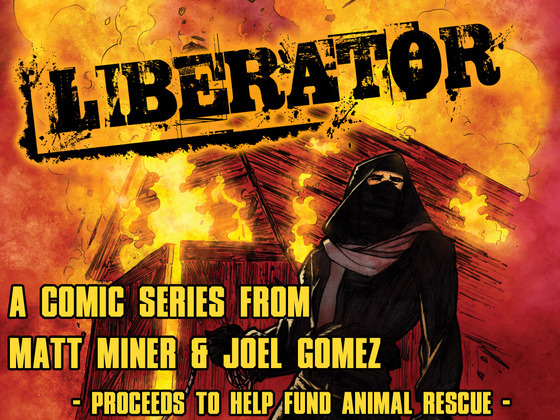 The heroes of Liberator are animal-friendly role models to the young people that the book is geared to. They are rescuers and activists who, rather than beating up supervillians or stopping interplanetary war are taking on real issues of dog fighters and animal abusers. My part of the proceeds will help fund Sloane and my continued animal rescue in the Rockaways, NY and the anti-BSL work that BSL News does. There are more articles available – check the NAALPO site, VeganSciFi.com, Bag & Bored blog, Comicosity and more where I discuss my plans for any proceeds. … yeah, read that and tell me again how I’m “cashing in” – I’ll tell you what I “cashed in” to get this far on the comic and that’s my entire 401k. ← Liberator Kickstarter going strong!